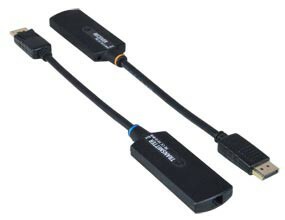 The XTENDEX® DisplayPort Extender via Fiber Optic Cable locates a 4K DisplayPort display up to 3,300 feet (1 kilometer) away from a video source using a single SC multimode fiber optic strand. Each extender consists of a transmitter that connects to a video source and a receiver that connects to a display. Also known as: DisplayPort Optical Extension, DisplayPort extender, DisplayPort digital to multimode fiber, UHD optical extender, graphic extension modules, 4Kx2K fiber optic digital video extender, displayport over fiber balun. Signal transmission via single-strand multimode SC fiber optic cable - no RF interference. Supports Ultra-HD 4K (3840x2160@30Hz),2560x1440, HDTV resolutions to 1080p and computer resolutions to 1920x1200. Compact and durable design - allowing for easy connection and placement. Video bandwidth: 3.5Gbps per channel. Compatible with DisplayPort standard V1.1a. One simplex SC fiber optic port for sending/receiving high definition video/audio signals, and DDC signal. Resolutions: supports Ultra-HD 4K (3840 X 2160@30Hz), 2560x1440, HDTV resolutions to 1080p, and computer resolutions to 1920x1200. 100 to 240 VAC at 50 or 60 Hz via AC adapter (US AC adapters included). Power consumption: 1.3W max each. 3,300 feet (1 kilometer) over 50µm multimode SC fiber optic cable. Use a simplex SC multimode 50-micron fiber optic cable to extend the receiver from the transmitter up to 3,300 feet (1 kilometer).